Another post from Philip Jackson, a colleague and friend of mine from Macedonia. Phil serves as the field leader and church planting team leader in the city of Skopje. Phil also runs marathons, and his first full marathon was the Athens Classic Marathon. His inspiration for running came about 15 years ago from a conversation with a veteran missionary couple who explained their reason for regular exercise was so that they would be able to serve the Lord into their nineties. 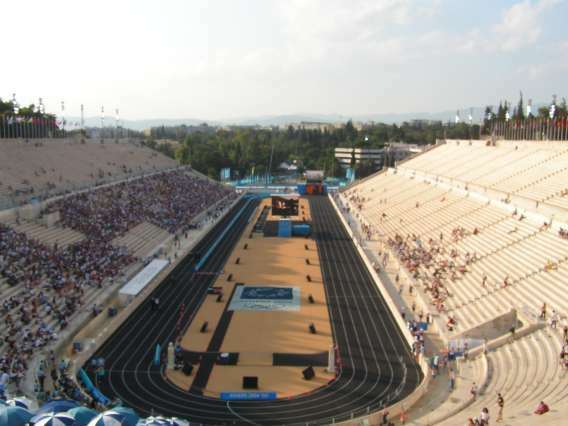 Panathinaiko Stadium is the finishing point of the Athens Classic Marathon. I am never going to win the Boston. In fact, it’s most likely that I may never even qualify for the Boston. At my age (currently 48), the qualifying time required is 3 hours, 25 minutes. My best so far is 3:48. Now I can easily go out and run the 7 minute 49 second pace required to qualify. No sweat, in fact. I can put many of those miles together, but the truth is that I can’t put 26 of them together…not yet at least. That’s another story. When we watch the elite athletes , many from Ethiopia and Kenya, running five minute miles for an entire marathon, we marvel at how they keep up that incredible pace. What we forget is that they are actually slowing down their pace as well. Most of them could run a mile in the low to mid “fours”. Some of them could probably even sustain that for many miles. But again not for 26. You see, a marathon requires you to pace yourself in such a way that you can actually go the distance. Those who don’t either quit or get injured. Some even die. and Levy Matebo, were neck-and-neck as they climbed Heartbreak Hill. What often happens to us in the Christian life/ministry is that we start out at a five minute mile pace, and we can usually sustain it for quite some time. Our youthful passion, our vision, our love for God and people can carry us for a long time, but the pace is not sustainable. In life, a sustainable pace is similar to training aspects of marathon training. Rest, for example, is absolutely necessary or muscles break down. Proper nutrition is critical or energy levels drop. Our walk with Jesus is no different. While teaching and serving as Missionary in Residence at Lancaster Bible College on a recent home assignment, a student asked me a few personal questions, as part of an assignment for one of his classes, about my spiritual disciplines. That question led me to consider my weekly habits. While I followed a general pattern of spending time with God each day, I did not have anything built into my schedule that gave me more protracted quality time with the Lord, a Sabbath if you will. I can honestly say that adding a weekly morning date with God to my schedule is one of the best decisions in the last few years. You see, it’s all about pace if you want to actually finish. A marathon pace requires slowing down. It also requires refueling. When I run a marathon, I refuel at every station, typically every 2 or 3 kilometers, drinking water, Gatorade, or whatever they have to offer. The same refueling is necessary for going the long haul with Jesus. Some readers may actually do just fine on a good daily time with God. Others will find that they need variety. Whatever the case, when your soul is telling you that you need a break, don’t just watch a video or get on Facebook. Make plans to spend some more time with God. Don’t reach for junk food, go for what your soul really needs. It’s a marathon after all.